Matrices: Theorems and problems related to find the inverse of a given matrix and solving equations by matrix-inversion method are very much important for a good score. At the same time, students may find difficulty in solving the equations by Gauss-Jordan method. Proper understanding of the steps involved in this method will help students to solve them easily. The concept of the rank of a given matrix is useful in verifying the consistency or non-consistency of the equations. Overall, this chapter is very much helpful in scoring maximum marks. "Vector Algebra" is the newly introduced unit for Junior Inter students in Paper-A. The knowledge of fundamentals regarding addition of vectors and product of vectors is applicable in the study of physics for MPC students. 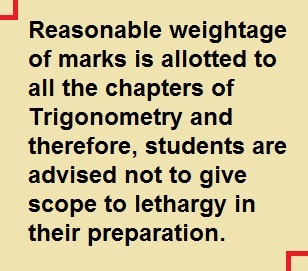 For MEC students, this chapter will help score marks in the examinations. Content wise, this chapter is easily understandable and marks wise, students can get more marks with less effort. Hence, MPC and MEC students are advised to concentrate on this new unit. Paper-A becomes more significant because of the unit called "Trigonometry". A section of students in tenth class used to ignore this unit because of the number of formulae involved in it. More number of formulae are involved in Intermediate level also. So, students cannot afford to ignore this unit at this stage. Various definitions, formulae and graphical representations make trigonometry a vast chapter. the text book need a repeated practice by the students in order to gain knowledge of trigonometric functions. 'Trigonometric equations', Inverse Trigonometric Functions' and 'Hyperbolic Functions' are the there chapters that require attention for the purpose of getting marks. The properties and graphical structures are very important in terms of their applications in higher courses. Easier problems are expected even in competitive examinations from these three chapters.